The Opel Adam is a funky little car named after Adam Opel, the founder of the company. Opel had a number of sons, and now the company is naming cars after them. The first one? Karl. 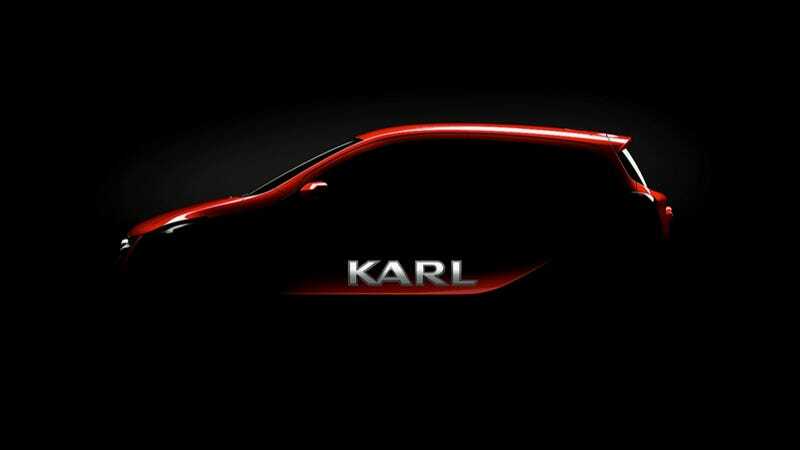 They're making a car called Karl. Karl. Karl. The Opel Karl will slot in just above (not below, as I asserted earlier. Though wouldn't it make sense if the car names after the kid was smaller?) the Adam in size. Makes sense since Karl was Adam's son. Opel PR says that "Karl is a short, snappy and catchy name that represents Opel brand values: German, emotional and approachable." As I see it, the name Karl is one of the three brand values that Opel represents. It's German. It doesn't really arouse any emotion in me or any feelings of approachability. In the interest of full disclosure, I grew up with a kid named Karl. He was a nice guy. But he was not a car. Sometimes a name just works for a car, like Dino. But Karl seems like it's just too common to be taken seriously as a car name. Also, it'll be bought by precisely zero people named Carl/Karl. "What kind of car do you drive these days, Carl?" "A Karl."